The E-Bike Battery section has been revised and updated and now contains new battery types. Next to our popular batteries with a cell capacity of 2900mAh we now have also batteries with 3200mAh cells. 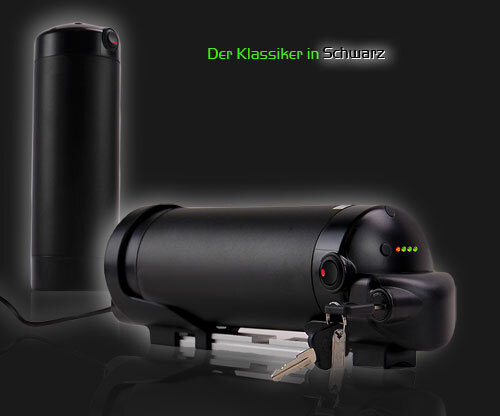 As the first supplier in Germany we are able to customize batteries with those cells individually. 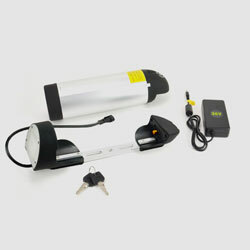 Each product line is available in two versions: 36V and 50V. we happily look back to 2014 as a busy and successful business year. A lot has happened, our company has moved to a new location. Now we finally have a show room and a much larger warehouse. With our new work shop and offices we are well prepared for future growth. We would like to take the opportunity to thank you for the trust invested in us and also your great sympathy during the weeks of our relocation. Now it\'s time for a break (and an inventory). 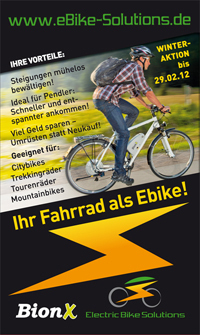 Electric Bike Solutions GmbH is on holiday from December 24th to January 6th. We will do our best to ship all orders to receive us until December 19th before Christmas. We wish all of you and your loved ones a happy Christmas time and Happy Holidays. Also have a Happy New Year 2015 - we are gladly looking forward to another year with you and your passion for electric cycling. Giving gifts and saving - that\'s how the holidays are fun. Our discounts on selected batteries not only make the presentee happy. No matter if replacement or back-up battery, order until January 6 and save big. Order until January 31 2015 and save on Christmas specials. In collaboration with the association Herzkinder ("cardiac kids") Ostfriesland we converted the first bikes for children with a heart condition. These children often suffer from a vast physical disabilities and therefore cannot use a conventional bike. 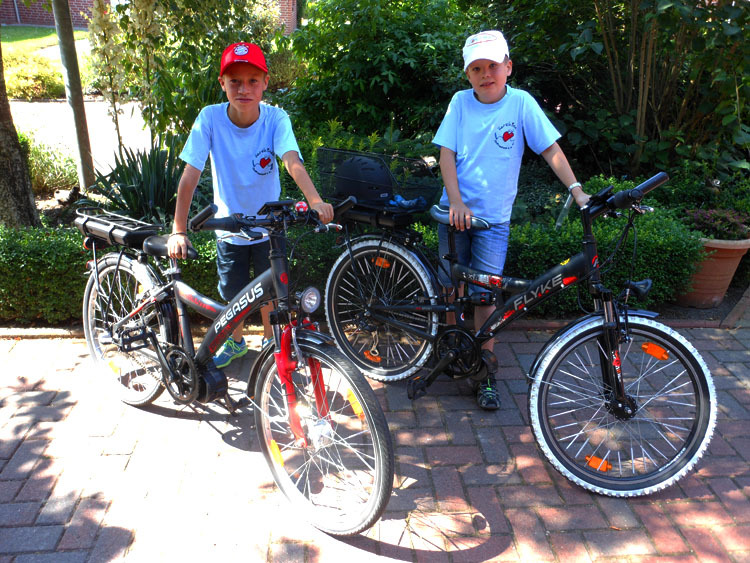 Using an electric bike they can participate in school outings and explore their surroundings with friends. This way they regained some independence because they can now ride to school on their own and do not have to be taken by their parents. We hope these children will have lots of fun cycling and we wish them all the besst for the future. Our batteries using the NCR18650BD cell from Panasonic have a greater capacity with the same dimensions. The larger capacity of 3200mAh instead of 2900mAh increases range by approx. 10%. Our popular EBS Water Bottle Battery now is available in black also. Not only colour has changed but shape and capacity as well. The black battery features compact construction and a larger capacity of 13.6Ah. the EBS BergFex ("mountain goat") boasts enormous climbing abilities due thanks to its BMC motor, while the EBS FREAK! with its Crystalyte motor is well-known for its high speeds. By reconstructing the page the conversion kits can now better be compared to and distinguished from each other. This way everybody can find the conversion kit that suits them best. see EBS BergFex see EBS FREAK! Phone number and addresses will stay the same, of course. Until then we can be contacted as usual. 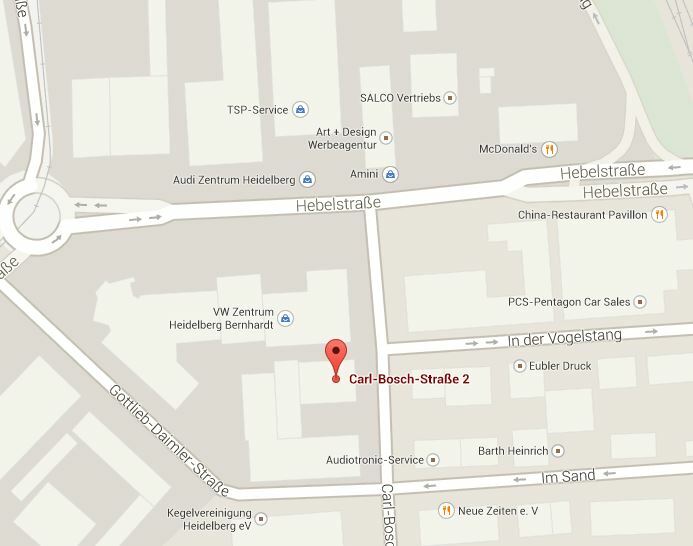 In our new location we can offer a spacious showroom and several parking spaces. We are gladly looking forward to welcome you in our new premises! To provide a faster handling of your order and a faster answer to your questions, we have adapted our phone hours to the high demand. We are always there for you: In the morning by email and in the afternoon from 1 p.m. also personally by phone. We also like to welcome you in our shop from 1 p.m. to 6 p.m..
Ebike Solutions wishes you Happy Easter! you and your family Happy Easter! 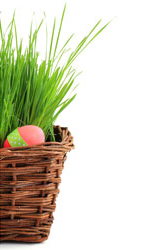 On Saturday April 19, 2014 between Good Friday and Easter Monday we are closed due to these holidays. 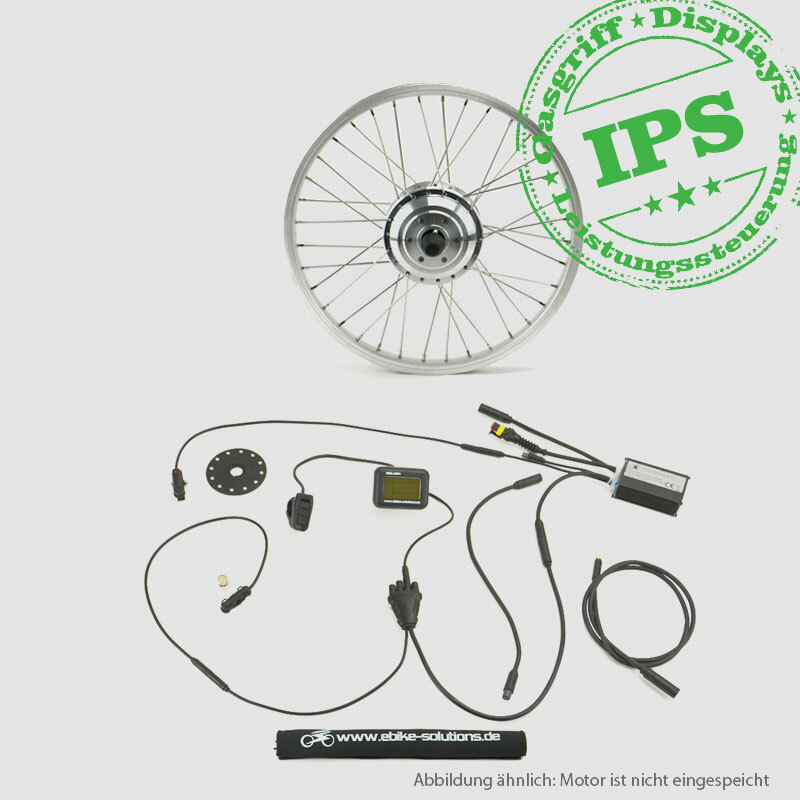 From now on we offer the long-expected EBS Mid-Mount Motor Conversion Kit in our shop. This compact conversion kit is fast and easy to install due its few components. No need to determine your type of bottom bracket and fitting cadence sensor set, since the PAS is already integrated into the motor. Since the motor will be installed into the bottom bracket you can keep using your hub dynamo and your gear hub. The EBS mid-mount motor is also compatible with roller brakes. in a 750W e-bike version! We thank you for your trust and try to be there for you again on January 2 2014. From now on you can rent the required tools from us: For every kind of bottom bracket we now have rental mounting tool set in stock. Simply order, convert and ship the tools back in the included card board box. You only pay the 9,90€ rental fee no matter which set you order! Please note our different business hours during the holidays. We are closed from Dec. 20, 4:30 p.m. until January 1 due to company holidays. We are there for you again on January 2. Christmas with Ebike Solutions - a unique gift! Now you can make your loved happy even easier - with the new EBS Delivery Service! Simply call us, we take care of the rest. and deliver it back to your door! Your pedelec under the Christmas tree - a unique gift! Order until Dec. 8 2013 to have your pedelec plus a Christmas surprise ready in time for Christmas Eve. Congratulations to your win of a GoPro Hero! 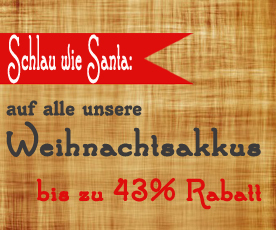 third place (150 € shopping voucher): Wolfgang Reek from Berlin! Thank you very much for the great videos!! Well done cross-breed - the new integrated controller! The EBS IPS non-sensor water bottle cage controller with 36V and 15A is the perfect cross-breed of mounting bracket and controller. The pedelec controller is mounted to the bottom of the water bottle cage. Cables are routed from the bracket directly to the controls and to the motor. This way you get an especially slim and unobtrusive conversion kit. + special mini controller for our EBS Folding Bike Conversion Kits. Until now the installation of cadence sensor and magnet disc were among the most difficult operations within a conversion. Now we have the solution for you! Using the chart you now can easily determine your bottom bracket: no matter if square tapered, Octalink or Hollowtech II-bottom bracket. The new cadence sensor set simplifies the selection of fitting magnet disc and cadence sensor. Adding the mounting tool set you immediately have everything you need to create your own conversion project. Only with us you will find the ideal solution for every bottom bracket type. 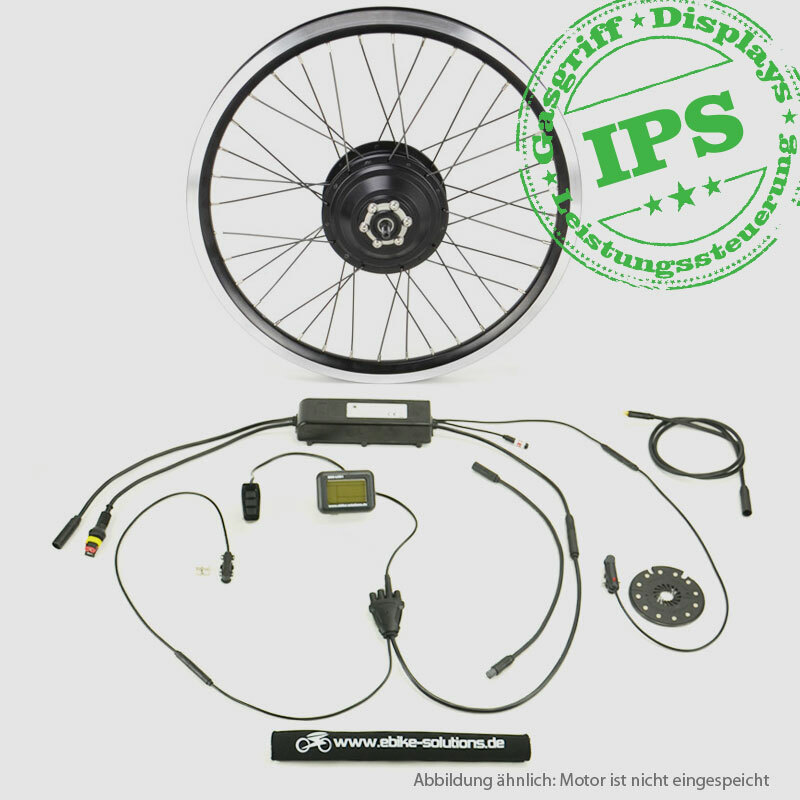 You bought a conversion kit from Ebike Solutions? Then enter the great EBS video contest 2013 and win sensational prices! "Show us your EBS Conversion Kit in action!" Send us your video of your personal EBS Conversion Kit by email until Sept. 30 2013. 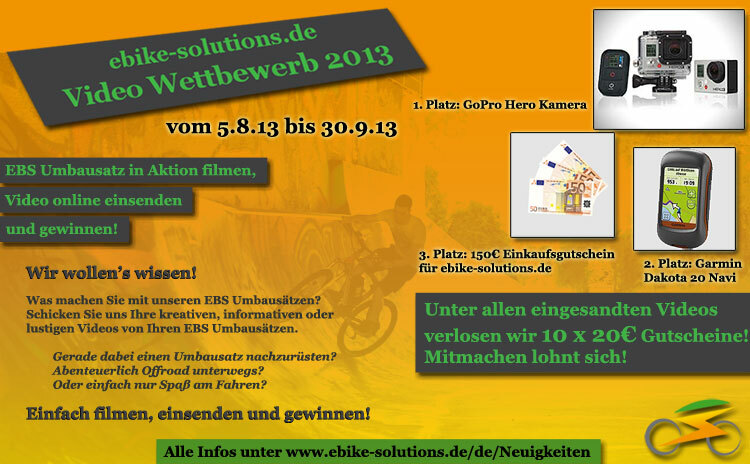 After having received the email we will post your video on our Youtube channel: www.youtube.com/EbikeSolutions. There, you can vote for your favourite into the top-five, using the rating system. From these entries we will select the winners of first to third place. Enter your video - it\'s worth it! In addition to the main prices we raffle off 10x20€ vouchers for our online shop. Find further information about the entry rules here. From now on the Bafang CST motor with cassette mount is available from us. This way all e-cyclists can enjoy a freewheel cassette\'s advantages. Keep using your existing cassette if you like. 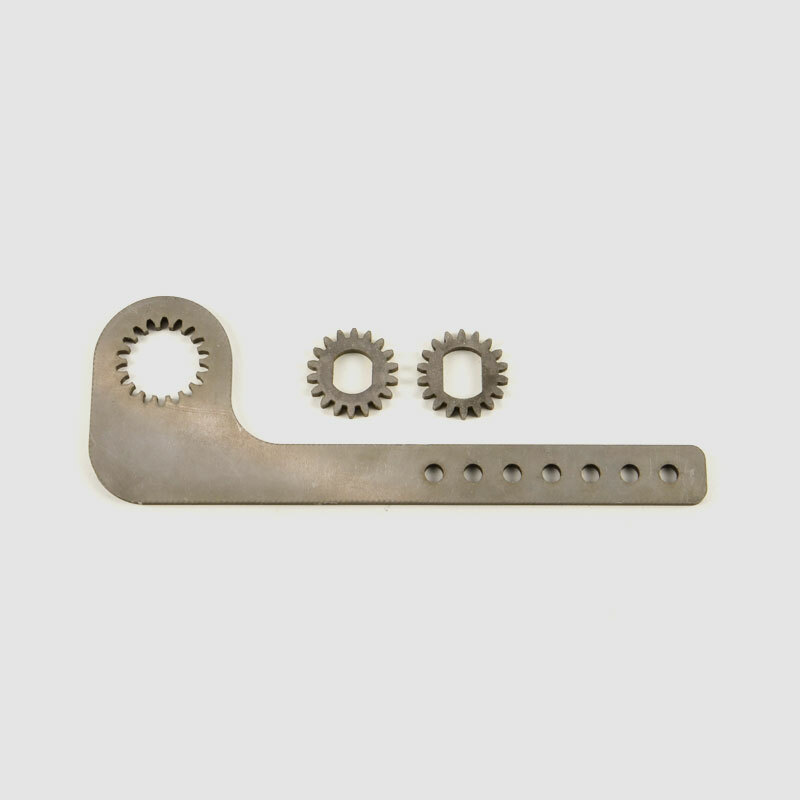 Benefit from the use of many gear ratios. We have completely revamped the popular Plug & Drive Conversion Kit and specced it with latest features. - Thumb throttle included: The new Plug & Drive Conversion Kit now features a thumb throttle. This way you get a start-assist up to 6 kph (4mph). All legal requirements are still being fulfilled. 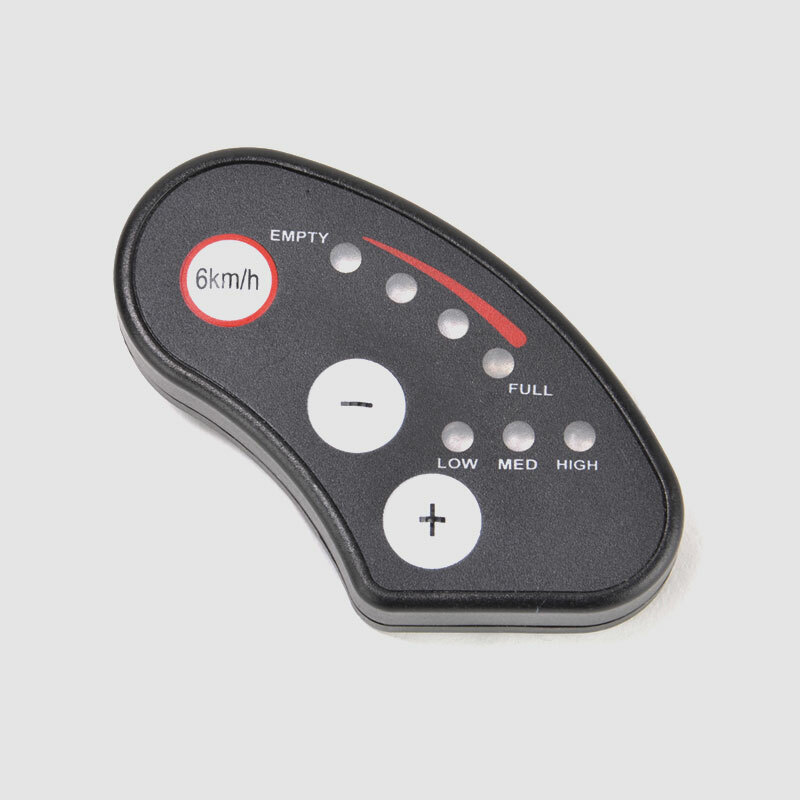 The thumb throttle allows an easier and more precise activation of the motor. Starting speed can therefore be controlled most exactly and using the thumb throttle, motor power can be modulated more directly and precisely. - personalized power control: Now you can tune your bike\'s handling to your liking even more precisely. The new technology enables a very precise modulation of power. This way you can control directly if you want to have a smooth or rather fast start. You can feel this modification through the smoother transition between steps.. This results in better riding comfort and a more natural handling. With a personalized power control your pedelec features a greater range,because in lower levels the motor uses less energy and thereby conserves battery capacity. - Display upgrade: The Plug & Drive Conversion Kit can be upgraded by a new display. They are available in landscape, upright or large format. These displays offer a larger display surfaceto make all data to be displayed more clearly. The LCD screen optimizes clarity and contrast of the display. For the best possible overview we recommend the large format display with the impressive dimensions of 50 x 102 x 47mm. Detail obsessed users will like the additional personalization features of the display in either landscape or upright format. Company car? - no, thanks! Since December company bikes and company cars offer the same tax benefits. A convenient alternative to the company car especially for those you live in proximity to their work. Those who have a longer commute will also benefit from this: Since electric bikes, too can be used as company vehicles. Yet, this applies for pedelecs only. The 25kph (15mph) maximum supported speed also applies. But also e-bikes and s-pedelecs can be registered as "company motor vehicle". Those who until now could not decide whether to retrofit their bike, now have the possibility to test how fun riding to work is. Using the "one-percent-rule" (German tax law) the pedelec can also be used in your spare time. A tempting offer that\'s definitely worth to think about. Advantages and requirements can be found here. 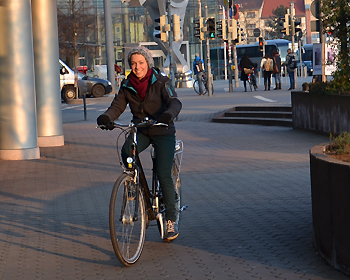 Until now it was not sure whether pedelecs with start-assist can be categorized as bikes. Since June 21 2013 these pedelecs are now categorized by law as bikes. This change of rule is noted in the Bundesgesetzblatt ("Federal Law Gazette") under no 29, art. 5. This clause also rules that electric bicycles with a start- or push-assist are allowed to use bike lanes/paths. License plate and a special driving license are not necessary. We are glad to see that electric bicycles have become a more and more important subject to legislators\' interests. Now you can order a fitting bike lock together with your conversion kit from us. 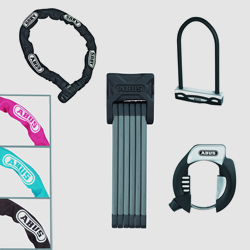 High-quality ABUS products protect your electric bicycle from unauthorized access. From chain locks to frame locks to the Bordo folding lock we have put together a first-class selection. We have substantially lowered the prices of: High-quality screw-on freewheels from Sunrace with large to very large gear selection. Ideal for very steep inclines. "Ride your bike to work"
June 1 is the beginning of ADFC\'s (German Bicycle Advocacy Association) and AOK\'s (German public health insurance organisation) campaign "ride your bike to work". Anyone can participate by riding your bike to work on at least 20 days within the campaign\'s duration. Distance is no matter. All bike enthusiasts are eligible for great prices. Campaign ends August 31. E-Bike managed to get five teams into the competition: From managing office to battery construction staff, they all take part. Visit our social media channels facebook.com/Ebike.Solutions and gplus.to/ebikesolutions.de to learn more about the teams and support your favourites. Simply register, start riding and win prices. The new water bottle battery has arrived: With 9.6Ah it now offers more power. The mounting bracket was modified also: Contact are now placed directly inside the bracket and the power cable is tightly attached to it. This means increased comfort in installation and handling. The bracket is also visually attractive: No more extra cables and nicely inclined base plate. The team of Ebike Solutions thanks all its customers, partners and co-workers for a good year\'s start. 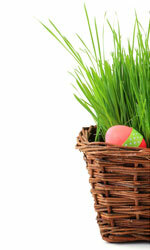 On Saturday March 30, 2013 between Good Friday and Easter Monday we are closed due to these holidays. 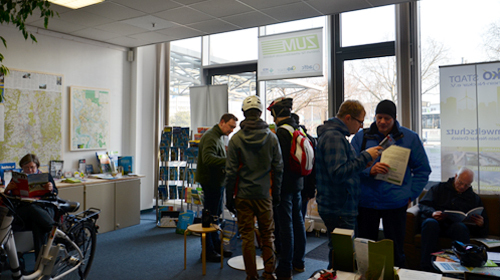 This year again our counselling days about pedelecs taking place at ZuM ("Zentrum für umweltbewusste Mobilität"/ "Centre for environmentally conscious mobility") were met with great interest. Electric mobility is on the rise. 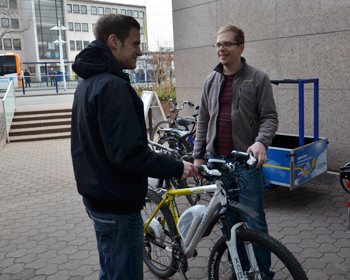 Newbies and experienced pedelec users came to gather information about different e-drive technologies. Conversion was in the focus of attention and our staff was questioned in great detail about the several possibilities of conversion. Test rides turned out to be the highlight. Most test riders came back with the typical "electric grin". For us this meant a great prove that electric mobility is fun. On April 27 and 28 Germersheim again will be THE venue for all bike enthusiasts. Exceptional is the word of the day. The world\'s largest fair for special-purpose bikes this year welcomes exhibitors from 15 countries. There\'s also a large lecturing program. Travel photographer and film maker Maximilian Semsch will be a guest. He travelled 16,000km (10,000mls) with his pedelec and thereby crossed Australia, the sixth largest country in the world within six month. E-Bike will be this year\'s fair main focus. 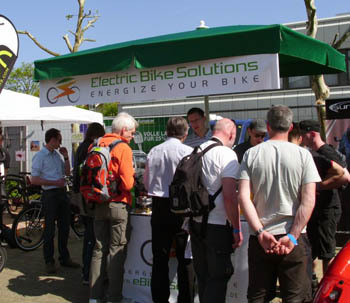 The Special-purpose-bike fair shows that electric bicycles become more and more important. 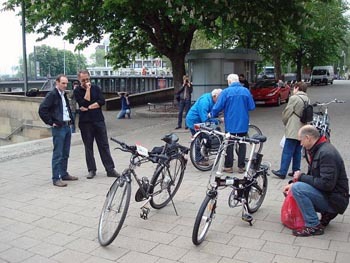 March 26 and 27 the "Eco city Rhine-Neckar" association will offer Counselling days about pedelecs. 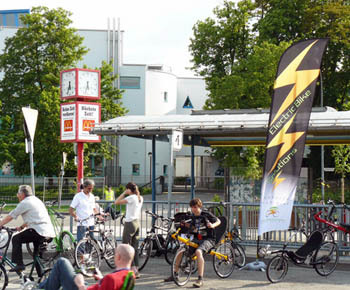 From 10 a.m.to 6 p.m. everyone interested can gather information about electric bicycles at ZuM ("Zentrum für umweltbewusste Mobilität"/ "Centre for environmentally conscious mobility"). We will be present on both days from 5 p.m. to 6 p.m.. There we will e available to answer all kinds of technical questions. We are gladly looking forward to welcome you! 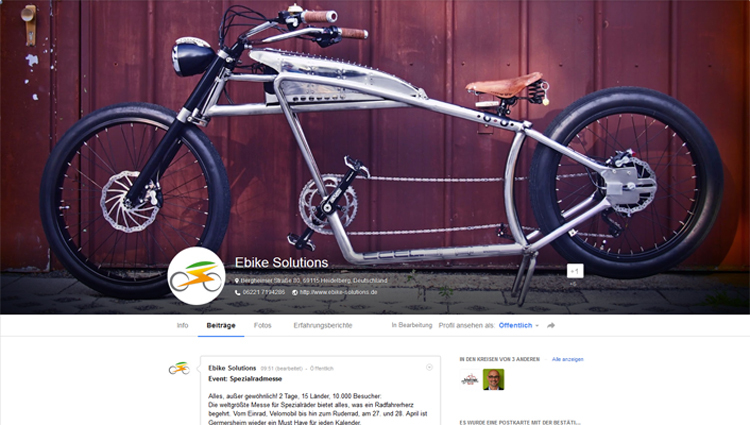 You can now visit us on our Google Plus page gplus.to/ebikesolutions. 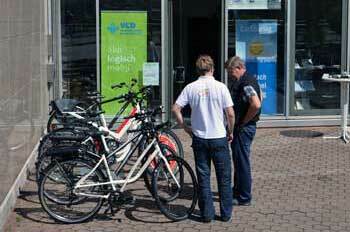 There we offer interesting information about e-bikes and pedelecs and attractive bargains for you. 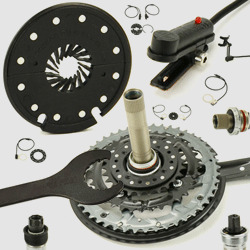 Did you have your bike retrofitted by us or did you install the conversion kit yourself? Send us your photos and we will post them on Google Plus! Have your bike admired by others, chat and comment other people\'s conversions. All this is possible on our new platform. We are looking forward to your visit and lots of interesting conversation. 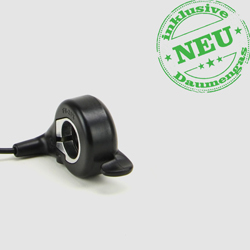 From now on the popular Magura kill switches for hydraulic brakes are available again. After having been unclear for a longer time, if Magura kill switches will ever be continued to be made, Magura now seems to be able to deliver, again. Of course we re-stocked our warehouse immediately and are now able to offer kill switches in well-renowned Magura quality. 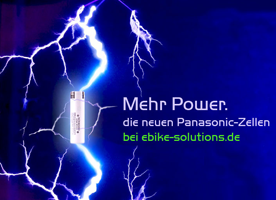 New generation EBS Hi-Power E-Bike Batteries. 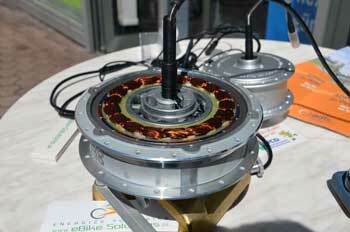 New EBS Hi-Power E-Bike Batteries offer the same range while being 20% lighter than e.g. BionX batteries. This is possible due to the use of 18650PD cells. At the time, his type of cell is the technologically best cell to be available for e-bike batteries in the market. 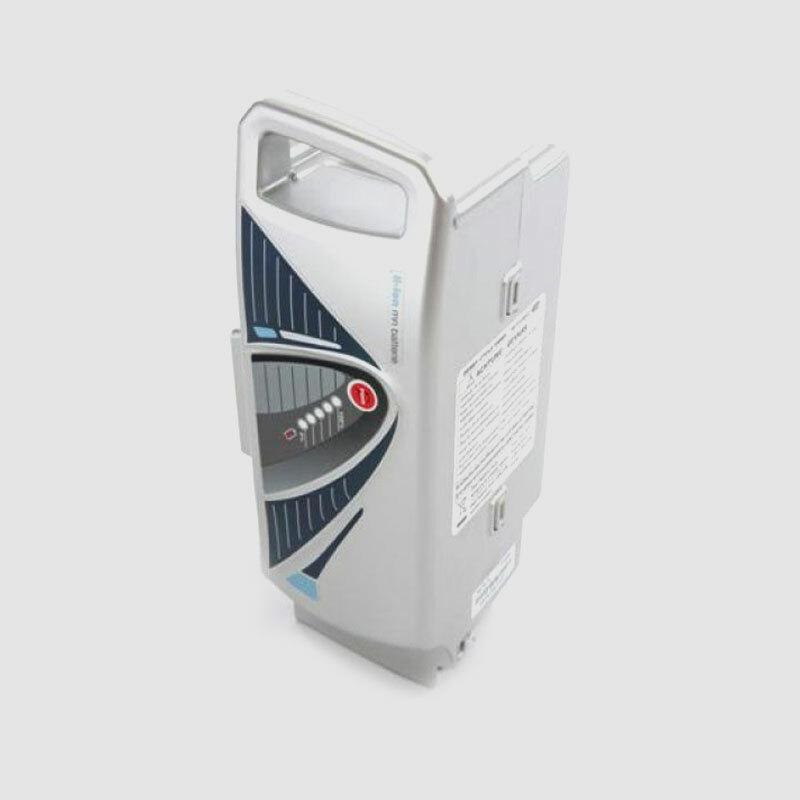 In addition to the weight advantage these cells convince by large capacity, high current ability and a very good voltage level. This way the battery offers more power and can supply energy to even the most powerful motors in order to make full use of their performance. For optimum charging and discharging cycles all EBS Hi-Power Batteries are equipped with a state-of-the-art Battery Management System. It ensures a battery\'s optimum charging and discharging and protects cells from over charging and total discharge. This way a battery pack\'s longevity and safety are significantly increased. 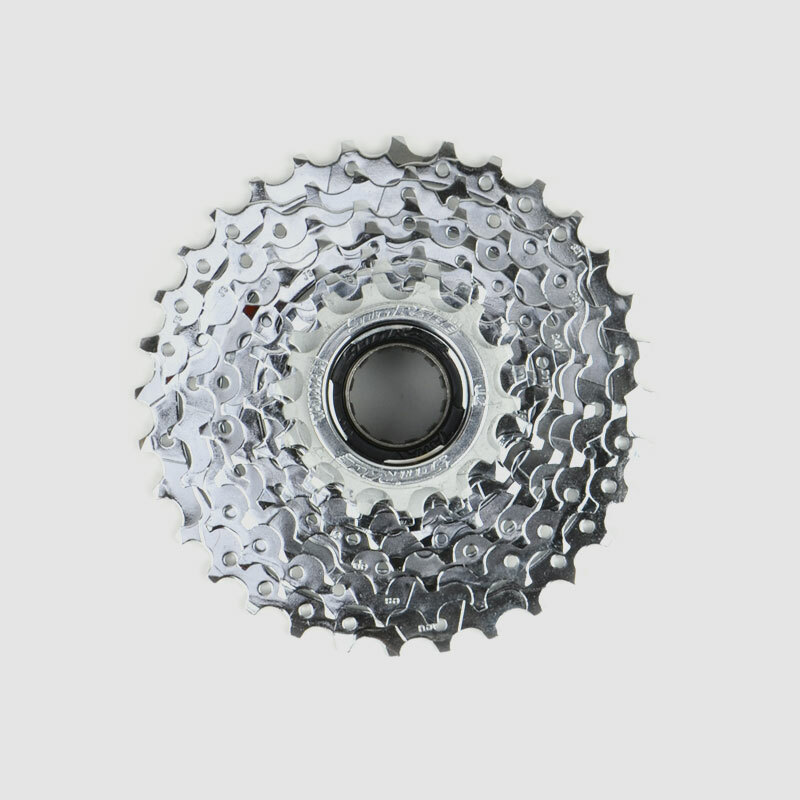 We are finally able to offer a 10-speed screw-on freewheel especially adapted to the demands of e-bikes and pedelecs. No matter what terrain you use your bike in, this freewheel always offers the right gear: With a huge gear selection of 11 to 36 teeth you can make optimum use your legs\' power at high speeds as well as on steep inclines. This version is exceptionally robust: Spider and spacers are made from gold-anodized aluminium, the sprockets from very tough hi-tensile steel. 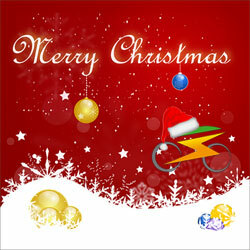 The Ebike Solutions team thanks all customers and partners for their trust and wishes all of you and your families Marry and peaceful Christmas and a Happy New Year 2013. After a successful and busy year we have our company holidays from Dec 22 to Jan 1. During this time, business will be closed. We are gladly looking forward to there for you from January 2. 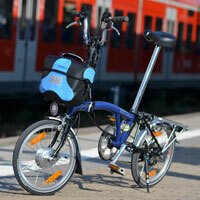 Electric mobility with your folding bike is now more simple and comfortable than ever before. 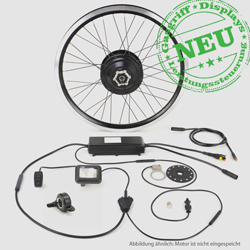 The revamped EBS Folding Bike Conversion Kit offers a whole new range of novelties: Reactivity and modulation are as good as never before thanks to the 12 magnet disc. When starting you will be supported after only a quarter crank revolution and coastdown time is only about half a second. 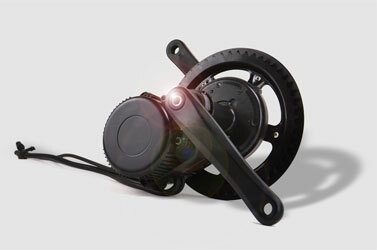 At 2kg (4.4lbs) only the EBS Mini Folding Bike Motor is the lightest gear motor in our selection. Additionally it accelerates your folding bike super silently and offer a high efficiency factor. The same comfortable display that convinced our customers with the Plug & Drive is now responsible for activation and control. The controller can withstand any weather and due to its compact size is well-adapted to the needs of folding bike riders. 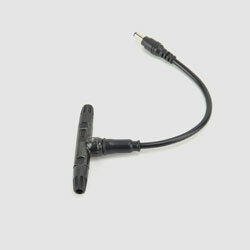 The ready-to-plug-in cables and splittable 12-magnet disc enable a fast and easy conversion. In June we were asked by regional public TV station SWR if we would like to introduce the matter of conversion in a report about the State Expo. Of course we immediately says yes. Since for most of us it was our first TV production, we were all really curious. We use this opportunity to thank the friendly reporting team. The Ebike Solutions team now will be available to you on Saturdays. Effective immediately we are open on Saturdays from 10 a.m. to 3 p.m.! We offer full service answer questions, accept bikes for conversion projects and supply technical support. Especially customers with longer journey will benefit from this, since these business hours do not collide with their work hours. Please visit us, we are happy to welcome you! 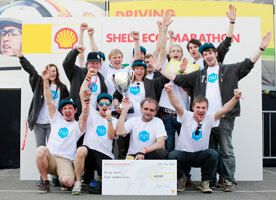 Ebike Solutions congratulates eco motion for winning the design award at the Shell Eco Marathon 2012. This university team was able to convince the jury with their prototype TILT. Ebike Solutions supported the university team with an e-drive system consisting of two Crystalyte HS3555 rear wheel motors including controller and two 48V batteries. 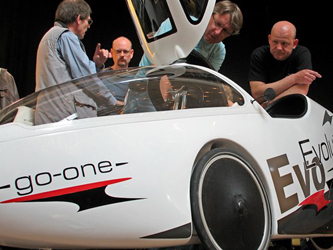 Ebike Solutions supported the development and construction team eco motion of Kunsthochschule Halle (Halle Art School) by supplying an e-drive train for the construction of a lightweight electric car. The one-person vehicle named TILT is propelled by two Crystalyte HS3555 rear wheel motors and two 48V batteries. 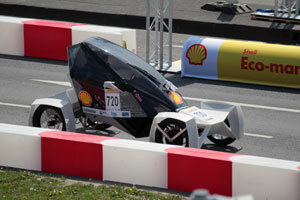 The vehicle will soon be starting in the Shell Eco-marathon 2012. At the time the team is working on the installation of the drive train. We keep our fingers crossed for the whole team! Or register to our newsletter to always be up-to-date. You will never miss novelties and sale items. Pedelec information day at the Heidelberg Centre for Environmentally Conscious Mobility. The EBS Plug & Drive Conversion Kit celebrates its debut at the pedelec information day at the ZuM (Heidelberg Centre for Environmentally Conscious Mobility) and made a great impression being built into a converted Hartje Parera. Visitors were convinced by the modern display, the easy handling and the very short coastdown time of the EBS Plug & Drive Conversion Kit. With the help of an opened Bafang motor we could demonstrate how a geared motor works. Plug-in components and go! - Conversion can be that easy! During the last months, Ebike Solutions has collected our customers\' wishes and developed a new kit based these wishes. 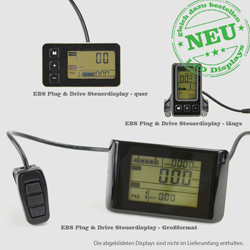 The EBS Plug & Drive Conversion Kit is very easy to install, features water-proof and reverse-polarity proof connectors, a slim controller for easy installation at the frame, a motor fast decoupling system and an advanced display. Upon request we also have accessory e-brakes in stock. You will be amazed by the smooth but powerful start and the low noise. Convince yourself with a test ride in Heidelberg! New Crystalyte motors have arrived! Effective immediately we have the new Crystalyte motors HS3555 and HS3540 in stock. Both motors use hall sensors for a smooth start and a brake disc mount. Call us when you are interested. Folding bikes become increasingly popular. No wonder, since the bike collapses with a flick of the wrist and can be transported by car or railway. 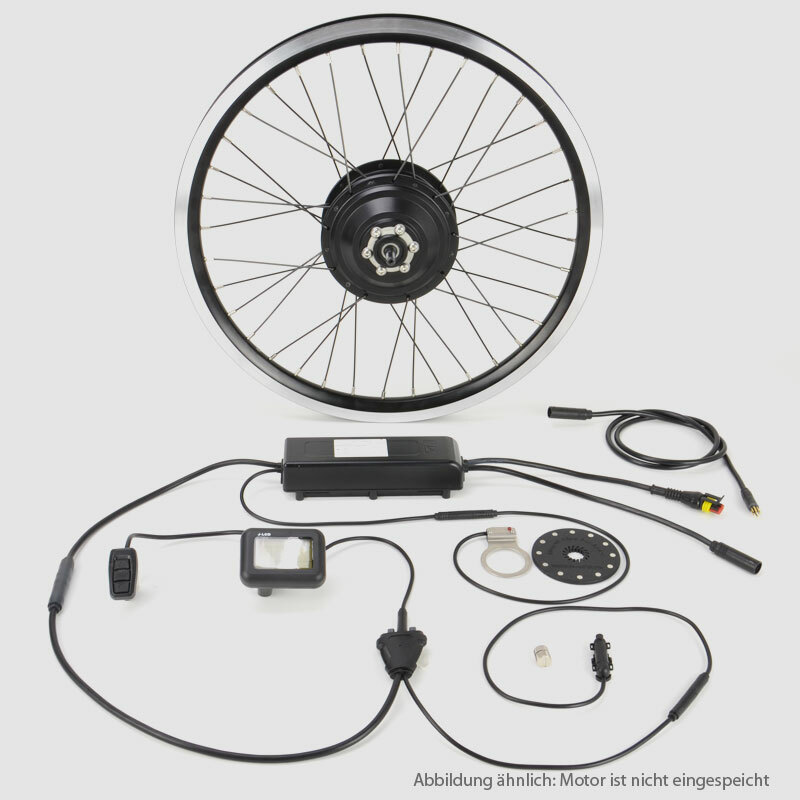 From now on longer trips are possible by folding bike: The EBS Folding Bike Front Wheel Conversion Kit turns your folding bike into a mobility marvel. The electric drive increases your range significantly and you ride fast and comfortable. 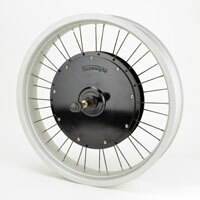 The electric motor from Crystalyte is especially quiet, smooth-running and elegant direct drive in an anthracite finish. Just in-time for the start of the year Ebike Solutions has two new products in stock. The universal torque arm is compatible to 12mm and 14mm motor axles. 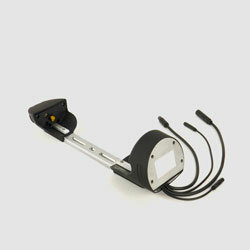 Additionally the torque arm can be mounted in several different angles. That way you have one solution for different applications. The team of Ebike Solutions thanks all its customers, partners and co-workers for for your trust and wishes Merry Christmas and a happy New Year. 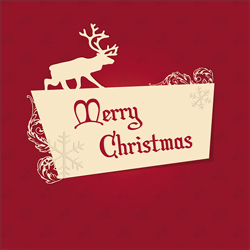 We are there for you between Christmas and New Year\'s Eve. 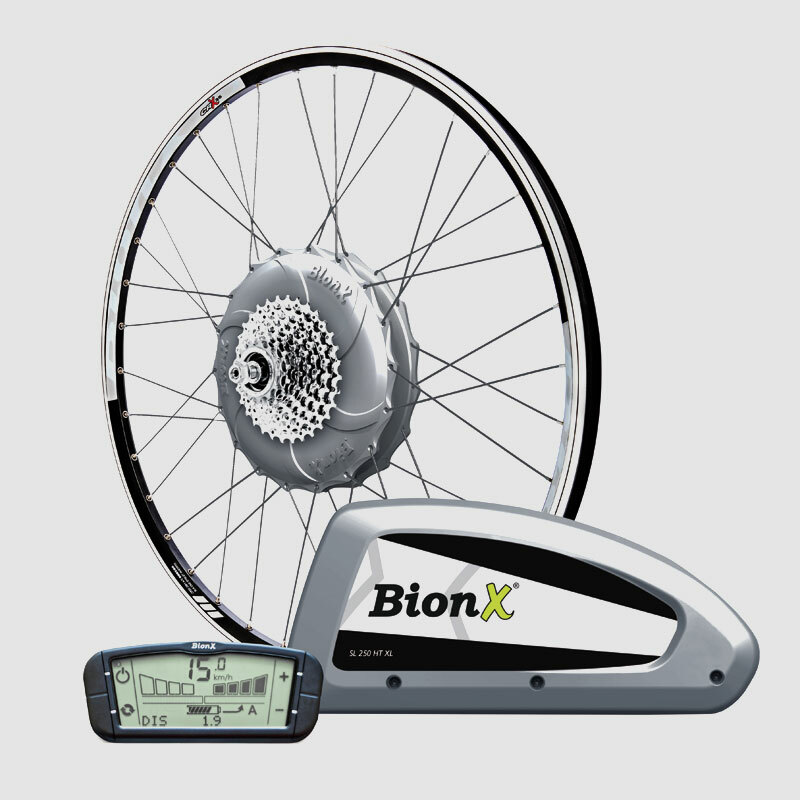 Effective immediately Ebike Solutions has the new BioX Conversion Kits in stock. We were convinced by the new motors\' activation by pedalling force and by their low weight that could be reduced by 25% while keeping the same power. Two versions are available in our shop. One version is attached into the frame triangle the other fits into the pannier rack. Since Nov. 1 we offer a different selection of improved Hi-power E-Bike Batteries with up-to-date technology. These will supply lots of power to your hi-power e-drive. By using state-of -the-art battery technology we achieve the best mix of safety, weight, voltage level and cycle stability. Effective immediately we offer replacement batteries for pre-produced pedelecs. 12Ah and 18Ah batteries compatible to Panasonic mid-mount motors are available. They fit almost all models of most manufacturers such as Raleigh, Kalkhoff, Victoria, Moover and Kettler. 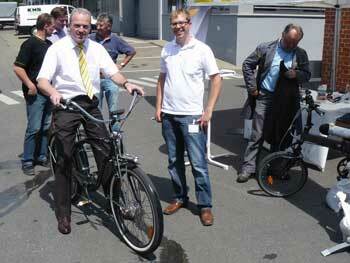 EBS inspires with e-bikes and pedelecs on Kärcher mobility day. Ebike Solutions presented several special-purpose conversions at the mobility day organised by high-pressure washer manufacturer Kärcher. With a large crowd attending there was also much interesting conversation about the matter of electric mobility. Employees and consumers were fascinated by the powerful but silent e-motors that were mounted into several bikes with completely different handling characteristics. Kärcher managing director Thomas Popp (see picture below right) was especially fascinated by our cruiser which he took out for a spin across the premises. This year we will be an exhibitor for the 2nd time at the 16th annual Spezialradmesse ("SPEZI" / special-purpose bike fair) in Germersheim. From April 30 to May 1 you can test our products by riding converted bikes. Our staff will be glad to talk to you personally. As last year,our booth can be found in the outdoor area A.18. This year, again, "spezi" was a exciting show. At our booth we were able to present a broad selection of conversion solutions to many customers, dealers and other interested persons. Our motor running in an opened casing and our demo station with three operational motors turned out to be real crowd pullers. Visitors were especially fascinated by our nine show bikes that could be test ridden on a test track or on a track surrounding the fair ground. A converted Dahon Jetstream bike driven by a 250W rear wheel motor turned out to be the most popular model. The elegant conversion kit convinces by low weight and high power. This enables maximum flexibility and powerful support. Another crowd pleaser was our converted Hartje Salerno with a Bafang 250W front wheel motor. The combination of electric motor and stepless NuVinci shifting offers optimum uphill support to the rider. This way, otherwise exhausting slopes can be negotiated very easily. MP and ex-Federal Secretary of Traffic, Wolfgang Tiefensee lectured about electric mobility on Feb 3 2011 in Heidelberg. After the lecture, Tiefensee and MP Lothar Binding took the opportunity to learn about pedelec and e-bike conversion kits from Ebike Solutions. 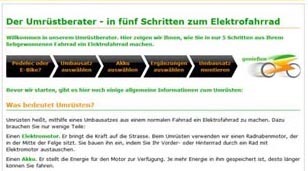 Ebike Solution takes over das-elektrorad.de. 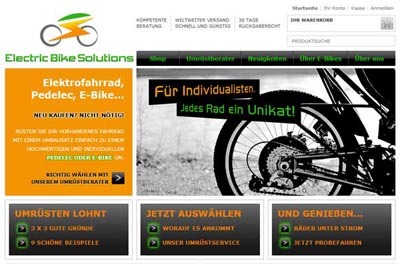 Ebike Solution takes over the website www.das-elektrorad.de and most of their stock. For personal reasons manager Frank Scheftlein does not want to continue operating the business. We will try to integrate his product into our portfolio to have them available for you as soon as possible. 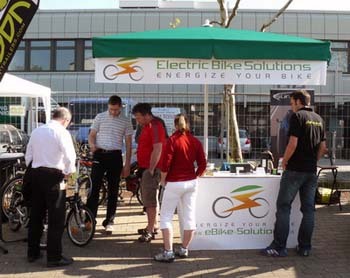 In sunny weather Ebike Solution staff informed interested visitors to the "Aktionstag Radwende Heilbronn" (campaign day "use a bike" Heilbronn) about the advantages of bikes converted to e-drive. By test riding visitors experienced electric mobility in real life. They had the choice between two converted Dahon folding bikes, one ideal for short to middle distances in city traffic one a touring bike for commuters. The public was very interested, and we would like to thank everyone for the positive feedback. 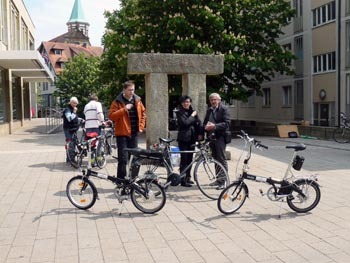 The organizers "Aktionsbündnis Radwende" (Campaign Alliance "use-a-bike") rallies for environmentally conscious mobility and for the promotion of bikes as a means of transportation in Heilbronn. 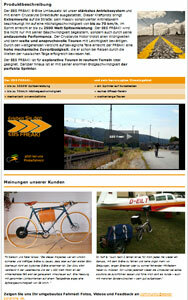 Visit us at "Spezi" (special-purpose bike fair) in Germersheim from April 24 to 25. April 24 to 25. Several folding and special-purpose bikes are ready for a test ride. Of course we will provide detailed advice for your planned conversions. Find more info about the show at www.spezialradmesse.de. Find us in booth 18 in the outdoor area. We are gladly looking forward to welcome you! 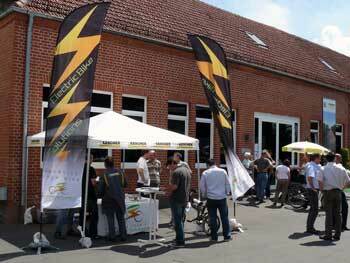 Update: Thanks a lot for your great interest at the "Spezi" (special-purpose bike fair) in Germersheim! This year it was our first time as an exhibitor at Europe\'s largest trade show for special-purpose bikes with demonstration material about battery design, three different electrified folding bikes, a cruiser and a recumbent. Though we had anticipated great interest in our conversion solutions, we were really surprised by the rush. We would like to thank all visitors for their questions, suggestions and orders. If you wish to cash your "SPEZI" voucher, simply enter the code into the comment section when ordering and transfer the amount of your order minus the show-discount. 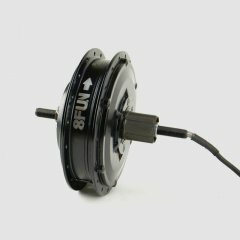 36V Bafang motors significantly lowered in price. Bafang BPM motors and non-sensor controllers (inc. Infineon) have arrived and are available. New charging devices have arrived, now available: Several charging capacities for 24V, 36V and 48V. Welcome Austrians and Swiss! From now on you can directly order from our online shop. Find more detailed information under delivery and shipping costs. Non-sensor Bafang motors and Bafang sensor-controlled rear motors are still being tested. 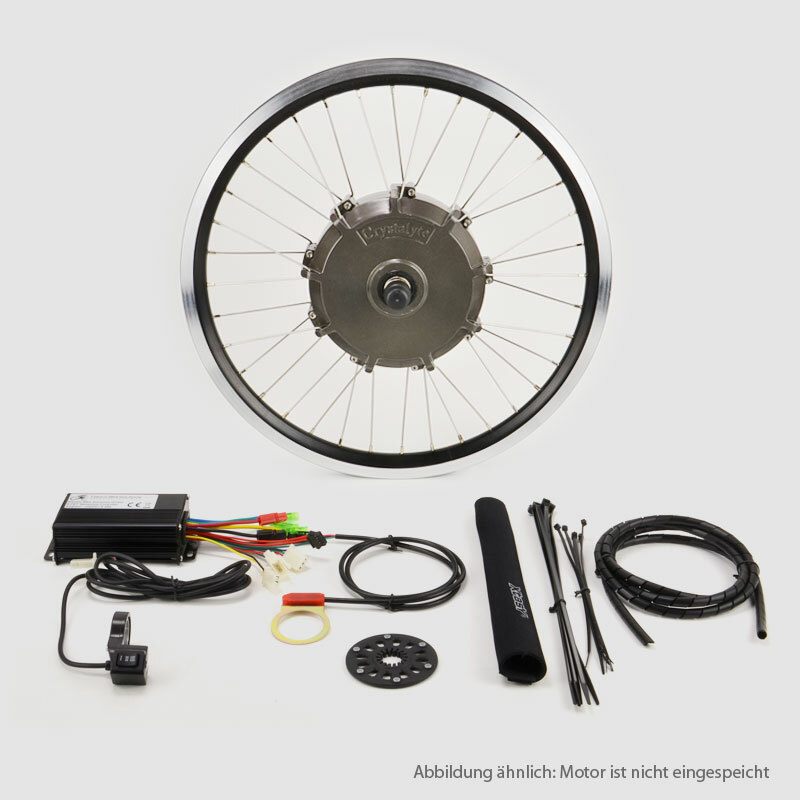 BMC conversion sets for rear wheel motors in several versions from 400W to 800W have arrived. New options: Personalized battery design - we have (almost) all battery sizes and shapes custom-tailored for you. Our web shop goes online - Welcome!